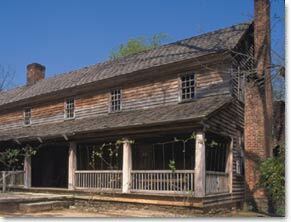 This stagecoach inn and plantation home was built around 1815 by James R. Wyly. He strategically located it along the newly constructed Unicoi Turnpike, a busy highway over the Appalachian Mountains. 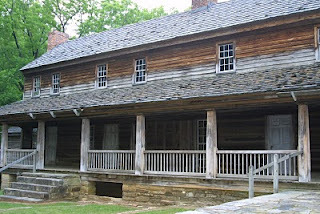 Wyly operated the inn until 1833 when he sold it to his neighbor Devereaux Jarrett, the ''richest man in the Tugaloo Valley.'' Jarrett continued to operate the inn, but doubled its size to make it the homeplace of his 14,400-acre plantation along the Tugaloo River. Three generations of Jarretts inhabited the site until the state of Georgia purchased the remaining few acres of the once-vast plantation for $8,000 in 1955. 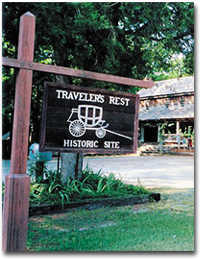 Thanks to both its architectural significance and its role in the early history of the area, Traveler's Rest was designated a National Historic Landmark in 1964. 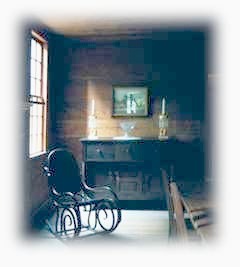 Today, visitors can tour the house and see many original artifacts and furnishings, some of which were crafted by Caleb Shaw, a renowned cabinetmaker from Massachusetts. ?Here I got an excellent breakfast of coffee, ham, chicken, good bread, butter, honey, and plenty of good new milk for a quarter of a dollar . . . What a charming country this would be to travel in, if one was sure of meeting with such nice clean quarters once a-day! ?